Like the golden, sparkly sun on a plate! Soft, tender golden layers studded with orange zest and softened with vanilla are filled with orange-vanilla bean pastry cream, the frosted with vanilla-orange zest buttercream. Writing in honey adds shine and golden sweetness while the demerara sugar on the sides and edges add a delightful sweet crunch. The sun has truly amazing powers over the psyche, doesn’t it? But because I was born and raised in Southern California, for many years, I never truly appreciated the sun. In fact, I would get downright annoyed with it. It was hot and smoggy most of the year and those two words were so frequently linked that they’ve melded into one thought–hotandsmoggy–and hotandsmoggy was, for over three decades, associated with the sun, which is sooo not a good PR move for the sun. And aside from that, frankly, when it’s sunny 50 weeks of the year (ok, slight exaggeration, but only slight), it gets boring. However, now that I’ve been a Pacific Northwesterner for nearly 9 years, and now that I know I will never be anything else, I also know that I truly, deeply appreciate the sun in the way any good Pacific Northwesterner does. I swear that we all hear music from the sky when the sun in shining. And it makes us all so stinkin’ happy! My goodness–when the sun starts shining and people spill outside en masse as though church just let out, we all turn into the friendliest, happiest, most courteous, most chatty people you’ve ever seen. When you learn to be ok with as much gray as we get, the sun suddenly becomes a big, huge deal. And when you get as much sun as we have this particular February, it’s almost starting to feel like we’re “normal” people. It’s so nice! Today’s cake feels a lot like the sun to me which is so appropriate considering the family for whom it was made. And if you know Jen, the mom who did the asking, I know you’ll agree. Jen is warm and friendly and funny and earthy and relaxed in all the nicest ways–just like a beautiful sunny day. Even though our social lives bring us together only occasionally, Jen is someone I always feel like I’ve known forever and I am always happy to see her. Jen asked me for a cake based on her family’s favorite flavors: orange and vanilla. Orange and vanilla like a creamsicle, like an orange cream soda, like a summer day. 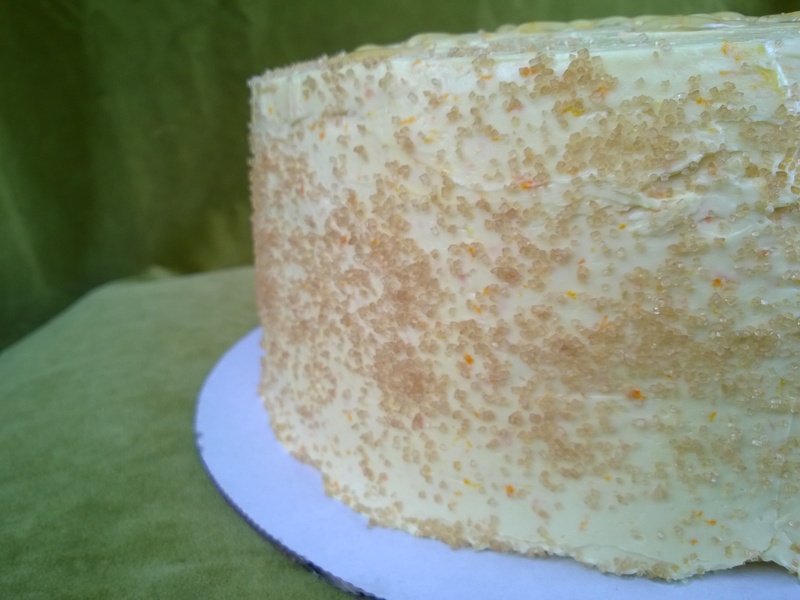 This cake is a lovely golden-yellow, speckled with orange zest and extra vanilla. The texture is so soft and tender that if it weren’t for the bright pop of orangey-ness, you’d wonder if you had a bite of anything at all. 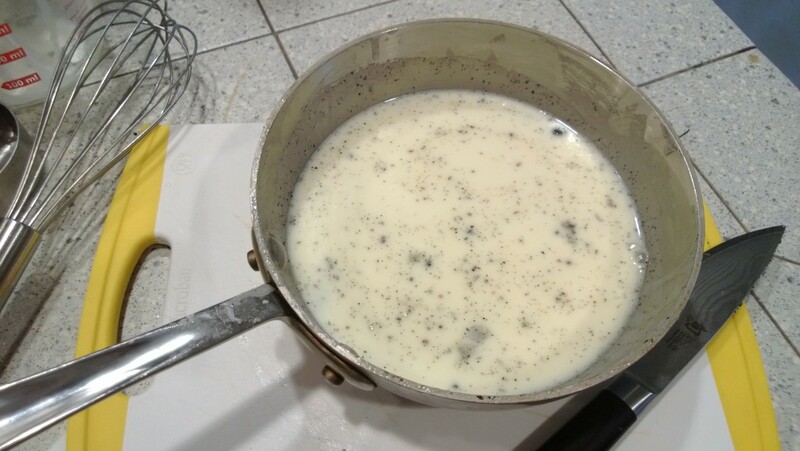 Whole milk steeped with orange zest and vanilla beans make this pastry cream taste exactly how an adult would want a creamsicle to taste. YUM. 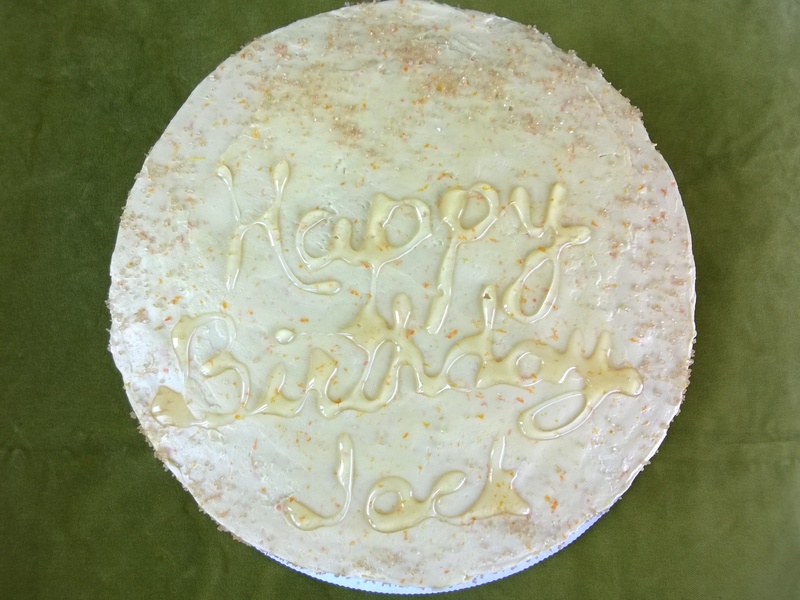 And last but most certainly not least, the cake is covered in a vanilla and orange zest swiss buttercream. Oh my. The soft, rich creaminess marries so perfectly with the brightness of the orange zest and sweetness of the vanilla. And because you can’t stop there, the sides are sprinkled with demerara sugar, adding not just an irresistable crunch of sweetness, but a lovely golden sparkle. And while I usually don’t write on the cakes, Jen asked me if I could so I did, BUT I wrote in honey(!). The honey adds such a deep, rich, luxurious sweetness (that of course goes perfectly with the orange) that I am confident that they’ll be totally ok with the glossy slightly spread out-ness of the writing. ; ) True, not quite as neat as writing with frosting I probably would have colored with artificial food dye, but oh so much more delicious and totally natural!!!! Demerara sugar looks like lovely golden glitter but it also adds a delicious crunch of sweetness to the vanilla-orange zest buttercream. So on this gray rainy day that comes at the end of a week far sunnier than we Portlanders deserve in February, I am delighted to have the opportunity to make a cake that is all about the sun. And honestly? I think the flavors in this cake make it my favorite but ssshhhhh–don’t tell the other cakes!! !